MontagueRhodesJames is a Legacy Library. Legacy libraries are the personal libraries of famous readers, entered by LibraryThing members from the Legacy Libraries group. » M. R. James's catalog. » M. R. James's legacy profile. MontagueRhodesJames is also an author. » See Montague Rhodes James's author page. 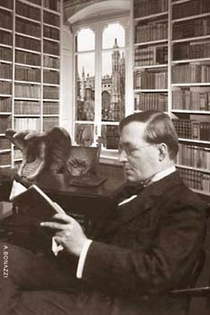 About meMontague Rhodes "M. R." James (1 August 1862 – 12 June 1936), English manuscript scholar, provost of King's College, Cambridge and Eton College, and writer of English ghost stories. About my libraryWhile unpacking his library in January 1919 after relocating to Eton, James wrote: "A shabbier and more variegated collection I doubt if anyone in my position ever owned—or more devoid of the ordinary works which fill most people's bookcases. No Macaulay, Carlyle, Grote, Gibbon, Byron, etc. etc. It comes partly of living next door to a library where they all were, just as I never used to buy port because I could get it from College." (Quoted in Michael Cox, M. R. James: An Informal Portrait, 200). Books included here include those sold at Sotheby's on 9 November 1936, as well as those mentioned in James' 1929 essay "Some Remarks on Ghost Stories." Books mentioned in the biographies of James by Michael Cox and Richard William Pfaff have also been added, as have books mentioned in James' letters to Gwendolen McBryde, as published in Letters to a Friend. Extant copies at King's College noted as having been donated by James are also included. Other collections remain to be added.